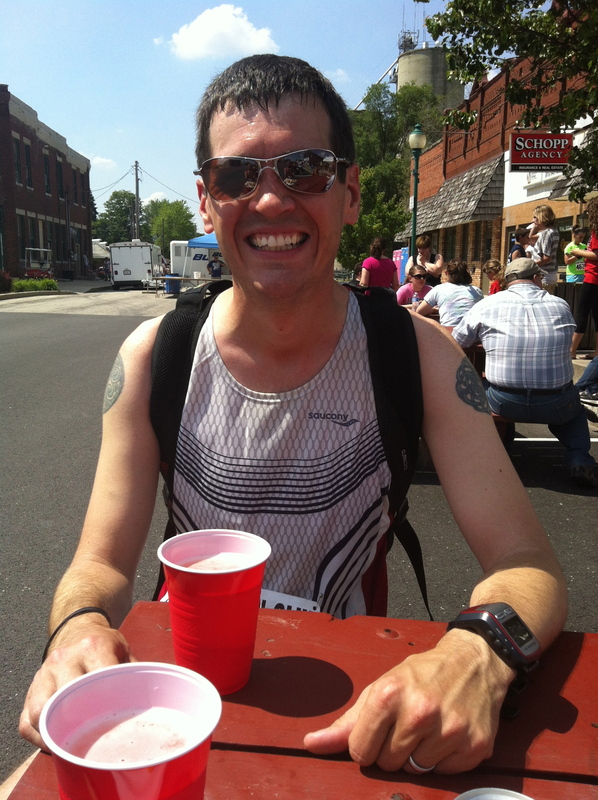 Last Saturday Rob and I ran a 4 Mile race in the small town Chenoa, IL. I work with the race director so it was nice to get out to support her (and her husband’s) event and check out a race we hadn’t done before. Rob and I went out for a 2.5 Mile warm up and found out quickly that this was going to be a super hot race. It was humid and the temps were 85-88 degrees already for this 10am race. We checked out the course and my legs were feeling good. Before we knew it we were off. I knew I had went out too fast because I wasn’t far behind the lead pack of guys, still I was struggling to slow down. I tried to back off the pace, but got to mile 1 in 6:39. Not a good call in the heat and without doing speed work. I would not be in any position to keep that up. I get to mile 2 in 14 and am still lead female, but fading badly. The baking hot sun is melting me and I know that I will get passed soon. Before mile 3 another female we race with often passes me as we talk about the heat. Normally I wouldn’t even get water on a 4 mile race, but by the time we got to the second water stop I couldn’t help but get water. The lead female even fully stopped at the water stop, but I couldn’t close the gap. 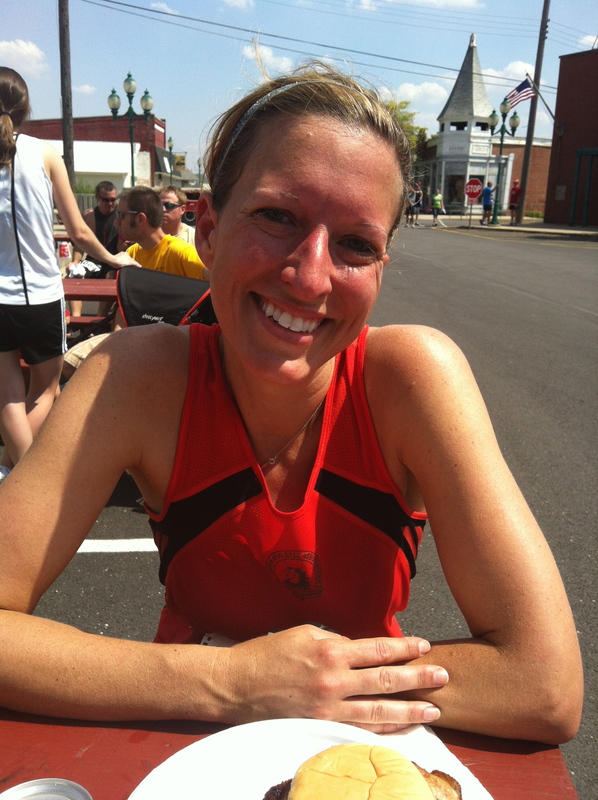 All I could do was just get there as fast as my melted legs would take me resulting in 2nd female, 1st age group (30-39). Rob also had a melty race, but got 3rd overall, 1st in his age group (30-39). Afterward your runner bib got you either 2 draft beers or a pork chop sandwich. So Rob and I used our bibs to split the sandwich and each have a beer. It was nice to hang out with the other runners and swap race stories. We will definitely look to run in this race again! 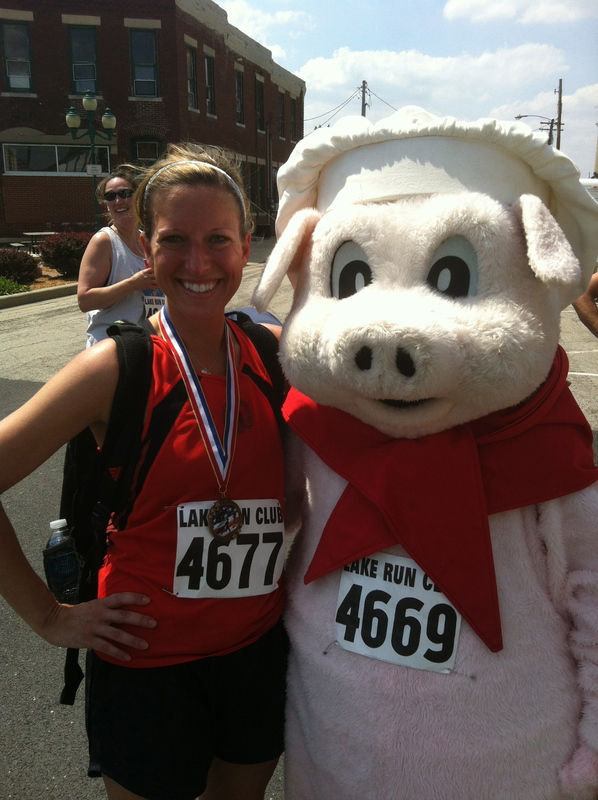 Me with the pig mascot. The pig did not run the race, but still it had to be so hot in the costume just walking around. That’s got to be one of the coolest post-race tickets. I love that you had a choice of either 2 beers or a sandwich! My hubs and I would have done the same thing and split them. Well done! Running in the heat is no joke. There’s nothing more refreshing that an ice cold beer after a run, especially if it’s hot 🙂 CHEERS! I understand on race conditions being too hot. I have come to realize that PRing is probably out of the question this summer. It will be hot. Nice job though!